Two of those executed were contributors to Spark, a short-lived magazine from Gansu Province whose young, intellectual contributors bravely shone a light on the horrific realities of life during the Great Leap Forward. More than 35 million people died of famine between 1959 and 1961, in large part because of Communist Party policies. To this day, the Party has never fully acknowledged the scope of the disaster. 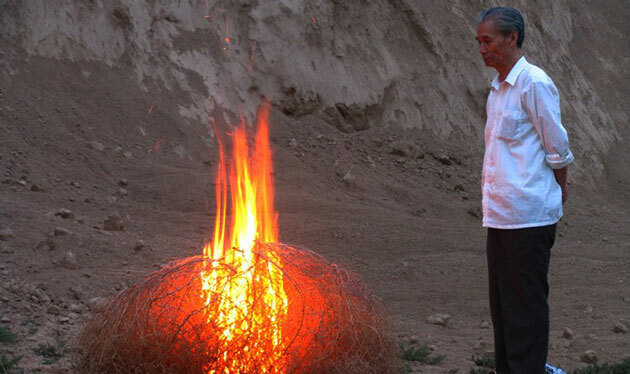 In SPARK, filmmaker Hu Jie—who has been described as “China’s most important unofficial historian-filmmaker”— tracks down the surviving men and women of Spark, including founder Gu Yan, allowing them to tell their stories. Weaving together their interviews, the film is in an oral history of the magazine and the tumultuous period that from which it arose. The interviews are striking in their clarity and their emotional immediacy 60 years later. The son of Du Yinghua, a local Communist Party county committee secretary executed for his sympathy for the Spark writers, breaks down in tears after laying out copies of his father’s books. Tan Chanxue seems completely at ease—even smiling—as she recalls being herded, bound, through throngs of schoolchildren brought to witness and cheer the Spark members’ public outdoor trial. Remarkably, Hu even gets the Tianshui City leader at the time, Tao Yanlie, to admit that authorities prevented people from leaving town, while 100,000 residents died of hunger. Their deaths, he says, were “recorded but useless. We had to report it, but so what?” At one point, Hu suspects he is being followed. During an interview, the phone rings. The interview subject replies, then refuses to continue the conversation. The writers who contributed to Spark were not all driven by the same motives. Xiang Chengian, who describes thousands of bodies lining the railway tracks between station and city, thought Party officials must be unaware of the extent of the disaster and would intervene if they knew. In contrast, Zhang Chunyuan wondered how the Communist Party could have become so corrupt in so few years, and said it was clearly fascistic. And Lin Zhao, one of several women contributors, couched her critiques more obliquely, in the form of poetry. All were branded as rightists and faced persecution during the Anti-Rightist Movement of the late 1950s, and both Lin and Zhang were sentenced to hefty prison terms, subsequently changed to death sentences. A brave and powerful document, SPARK is a testament to the threat to power that comes from people willing to speak out about what they see—and an invaluable contribution to understanding the period of the Great Leap Forward. SPARK makes an excellent companion to Wang Bing’s monumental DEAD SOULS, about victims and survivors of the Anti-Rightist Movement, and Hu Jie’s SEARCHING FOR LIN ZHAO’S SOUL—which details the persecution of Lin, a Christian, and is a testament to her legacy of courage and conviction. China is doing everything in its power to silence filmmaker Hu Jie, but he remains on his lonely mission to document the country's true history.